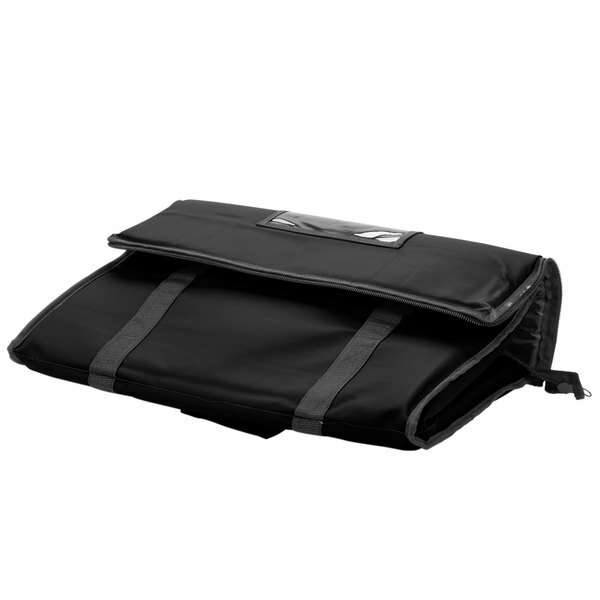 ServIt Soft-Sided Bun Pan / Rectangular Pizza Carrier, Black Nylon, 28" x 20" x 6"
Control food temperature during your restaurant's delivery service with this Choice black insulated nylon pan carrier! 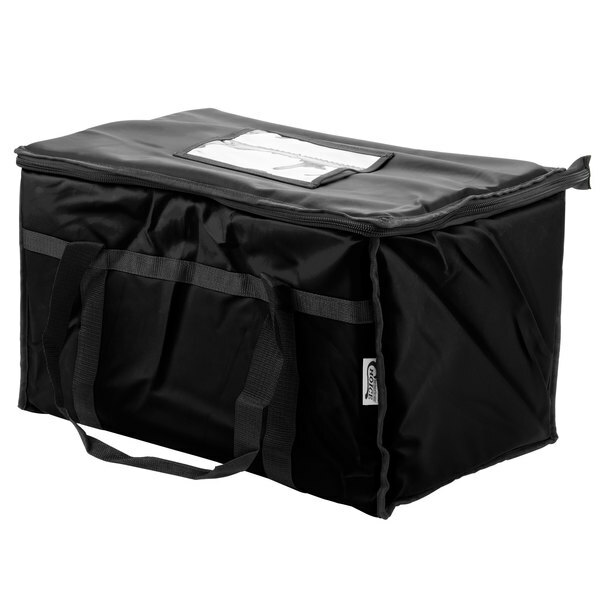 This carrier is perfect for delivery, outdoor gatherings, or transportation to catered events. The top load design creates a broad area for quick loading and unloading of containers. Each carrier can hold up to five full-sized 2 1/2" deep food pans, as well as a combination of different fractional-sized take out containers. "My first time buying a delivery bag and I'm happy with my choice! These bags are sturdy. They even hold full size pans and have space on the sides to insert freezer packs. It holds the temperature for a very long time. I'll be buying more!" 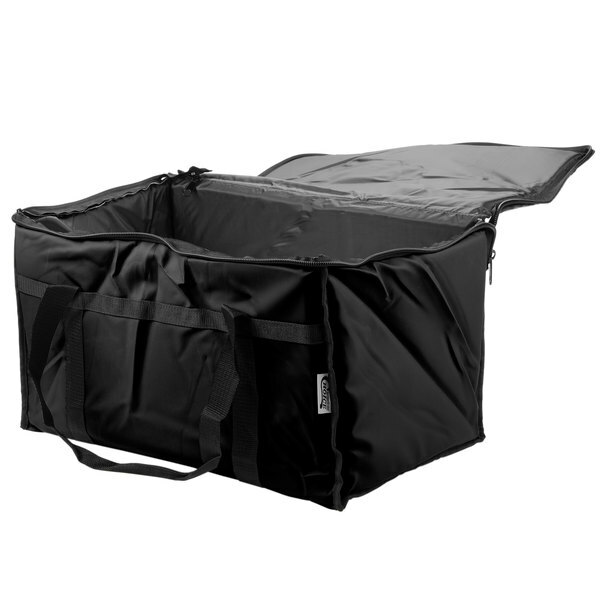 Featuring durable nylon carrying straps, this container can handle your heaviest load of deliveries while still being comfortable to hold. When not in use, the bag collapses into a smaller size to make it easier to carry and save valuable storage space. A clear label is available on top the lid to quickly identify carrier contents. It's also a great location for menu cards. Its durable and water-repellent nylon exterior will remain immaculate despite rainy and snowy weather. Water or messes wipe right off the surface for easy cleanup. A zipper runs along the top of the bag to ensure that food items remain securely packed inside and to enable easy opening and closing. 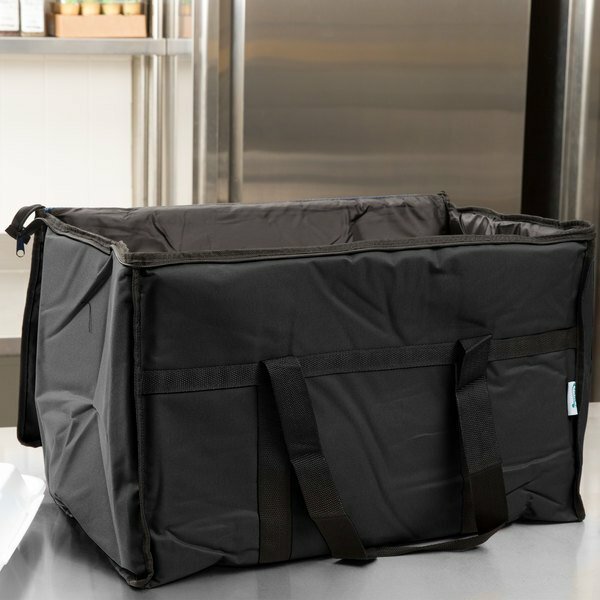 This carrier's 1/2" thick layer of insulation keeps warmed foods hot and cold foods chilled as you travel to or from the venue. Plus, the interior is roomy enough to hold hot or cold packs, too! Choice insulated food delivery bags / pan carriers are available in an assortment of colors. Use this classic black color to ensure a clean, professional presentation, while helping color-coordinate your food and drinks for increased organization and decreased chances of cross-contamination. How long does this carrier keep the food warm? Is it comparable to the heavy plastic carriers that keep food warm for up to 4 hours? This carrier is more suitable for delivery, rather than long-term holding. The amount of time that the food stays warm really depends on the heat of the air and the heat of the food going into the carrier. 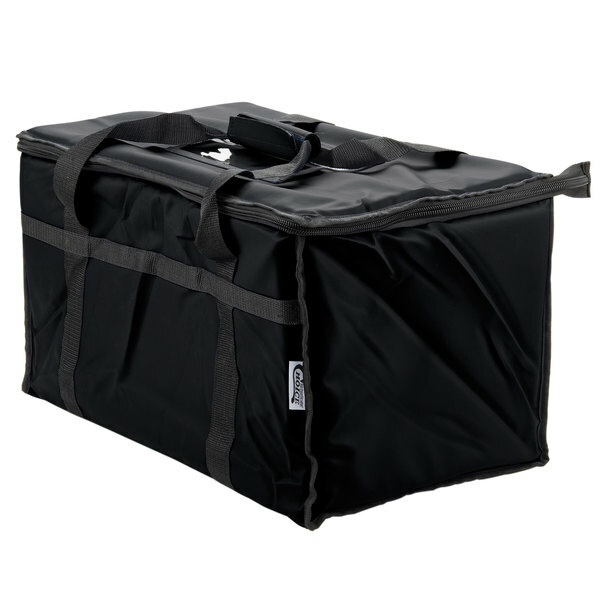 What types of items will fit in this insulated food delivery bag? 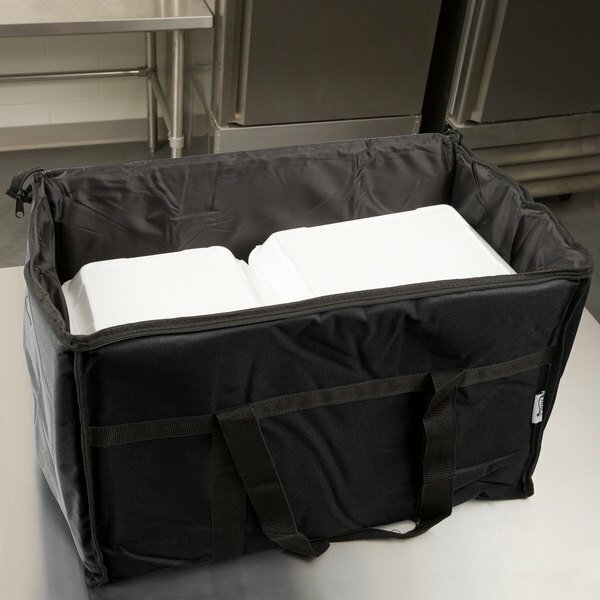 Transport and deliver food with ease using these Choice insulated food pan carriers! 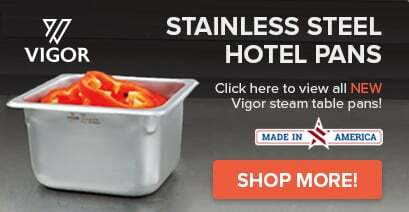 They hold up to five full-size, 2" deep food pans and can be loaded with hot packs to keep your items warm until served. 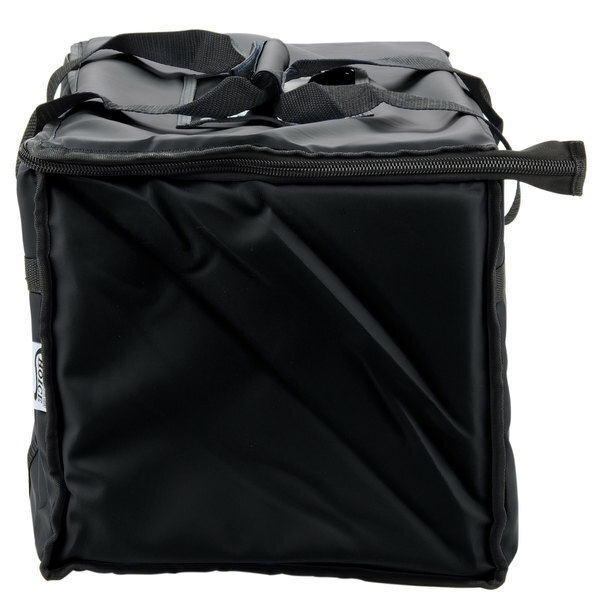 Offering great temperature retention and safe transport for your food, our Choice insulated food pan carriers are the perfect addition to your catering business or delivery service. With durable nylon construction, reinforced carrying straps, and heavy-duty zippers, these food pan carriers are built to last. 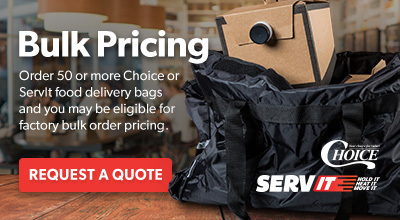 Thanks to the 1/2" thick insulation, these delivery bags keep your entrees, hors d'oeuvres, and sides piping hot until they reach their destination. 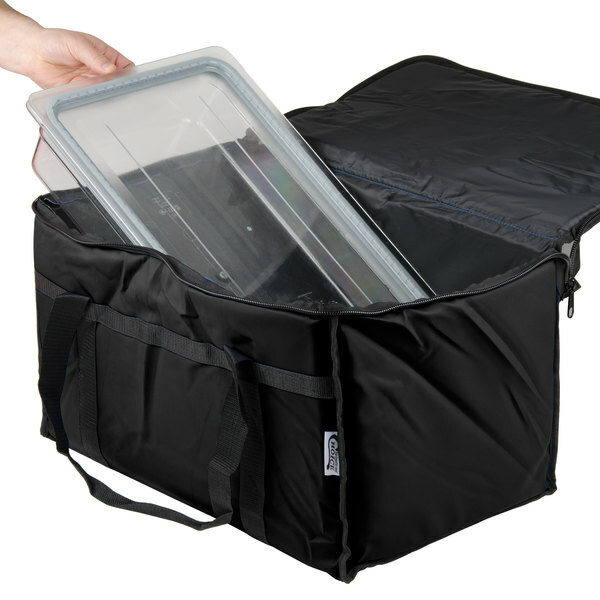 If it's cold food you need to transport, check out our Choice carrier kits. They come with a delivery bag and two foam freezer packs that you can re-freeze time and time again to keep your cold foods chilled and fresh. Intelligently designed, these insulated pan carriers come in a variety of colors, so you can designate different foods with different colors. In addition to our nylon bags, we offer economical vinyl options that are easy to wipe down and keep clean. All of our Choice food delivery bags are collapsible for easy storage and feature water-repellant interiors. The easily visible, clear pocket on top is great for labels, receipts, and more, so no matter what you're transporting and delivering, you'll always be organized and prepared with fresh product. Choice Insulated Deli Tray / Party Platter Bag, Black Nylon, 18" x 18" x 5"
Choice Insulated Food Delivery Bag / Soft Sided Pan Carrier with Foam Freeze Pack Kit, Black Nylon, 23" x 13" x 15"
Choice Insulated Food Delivery Bag / Pan Carrier with Microcore Thermal Hot or Cold Pack Kit, Black Nylon, 23" x 13" x 15"
Choice Insulated Food Delivery Bag / Pan Carrier, Blue Nylon, 23" x 13" x 15"
Overall User Rating: Choice Insulated Food Delivery Bag / Pan Carrier, Black Nylon, 23" x 13" x 15"
This carrier is great for keeping our meals hot/cold. But there is one major downfall. We have only used these carriers for packing our holiday meals, which breaks down to approximately 6 times. Out of the 20 that I ordered 6 zippers have failed, which makes the bag unusable. And we have at least 6 more zippers ready to fail also. We did receive one that had a different zipper that seems to be sturdier. I emailed customer service and was told that they have no warranty. So I guess this non-profit is out of luck. We appreciate your review, Carol! A Customer Solutions Representative is assisting you in getting a credit for the defective bags. These bags have been excellent for us! They keep products hot / cold for transport. High quality construction on ours, good sturdy zipper, no problem with ripping or anything. Easy to clean, just wipe / rinse as needed. Love these bags and will purchase them again as we continue to grow. These bags worked well for about the first coupe deliveries. Both bags zippers broke at the stopping point in the same location. Very disappointing because the bags are a good size and theoretically durable for food transportation. Thank you for the review, Don. We wish these would have worked out for you. A Customer Solutions Representative will contact you directly. This is the second bag we purchased, the build quality is very cheap. first bag came apart at the seams and shows a 1/4 in foam. The most recent bag, the zipper broke off the track on 3rd use. Not happy with these at all. Thank you for the review, Howard. We sorry to hear that the zippers on your carrier broke so quickly. A Customer Solutions Representative will contact you about this. These bags aren't constructed well. They are made with a thin foam liner and don't do a great job keeping food warm. The inner liner is not durable and easily tears when putting in aluminum full trays in them. I wish webstaurant offered a higher quality bag that can easily cleaned in and out for a higher price. Thank you for your review, Domenico! We are sorry you are not fully satisfied with this cooler bag. For a more water resistant option, we recommend trying these San Jamar FC2212-RD 22" x 12" x 12" Red Insulated Nylon Food Delivery Bags instead. I give it the 5 stars cause the price is very good, it fits 4 food trays at a time without worrying of them falling. Plus it maintains the temperature for a long time. This bag is legit! I can carry 50 lbs in it easy! Yes, the zipper was stuck a bit in the beginning. Thankfully I can utilize common sense and opperate a zipper. It’s legit! And if you’re smart, you can make spacers with type cardboard and plastic wrap. It is heavy duty and I put it to the test. Thank you. We had an event for the Superbowl, with 2000.00 wing. I was able to put 5 big trays of wings in each bag. It made it easy to carry, store and distribute all the food. I ended up purchasing 3 more. There was such a mess with the cardboard boxes, but no mess with these bags. Easy to clean out and pack away for next time. For the price. This carrier is great. Decently durable. Not the greatest insulation, but transfers trays very well. Clear pocket on top is great for holding the receipts. This is our second time buying these zippered bags, wanted to be sure it could handle the loads, read some bad reviews from 2016, but after using this for many catered deliveries we're confident they fixed the zipper issue, we're able to get 5 Full pans in here, it's snug but it zippered tight and kept food hot. 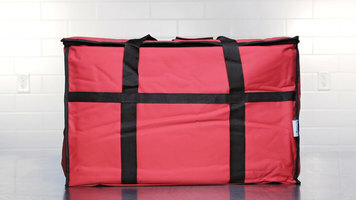 We purchased this Insulted delivery bag as a try out and it worked great for the company, deliveries are delivered warm!!! and it looks very professional,,the top pocket works great for the invoices and our product accommodates very nicely... we are going to purchase another one since it worked great!!!!! These delivery bags are durable and hold the heat/cold perfect. They are easy to clean and transport. The bags fit almost eight half pan catering items. As described. Very sturdy and holds more than expected. Easy to clean and keeps things at a decent temperature for a couple hours. Would purchase again. Our delivery drivers really love these bags. The black color means that they don't get dirty looking as quickly and they're long lasting and work well. This is a great quality insulated bag and perfect size. It's heavy duty and keeps food hot or cold. I was able to fit 5 full aluminum pans. I also used it to hold 9 1/3 size polycarbonate food trays. It's easy to carry and I haven't had any issues with the zipper as other reviewers have mentioned. I purchased this product a few months back to keep food warmed for parties. We have used them many times and they are still holding up very well. I plan on using them again for several catering orders.